Retracting the shoulders to improve upper back and neck posture, the Posture Support Corrector is designed for individuals with rounded shoulders and/or forward head posture. Non-returnable. Poor posture, including shoulder slump and forward head position, can lead to shoulder pain, back pain, neck pain and headaches. 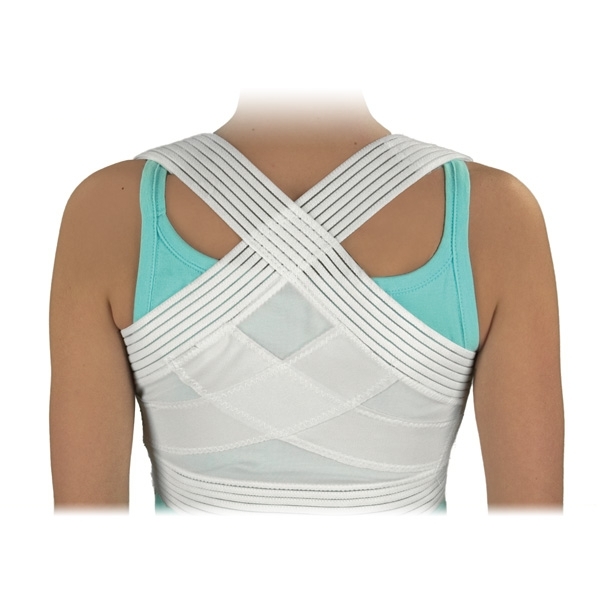 The Posture Support Corrector pulls the shoulders back into the neutral position to properly align the spine. 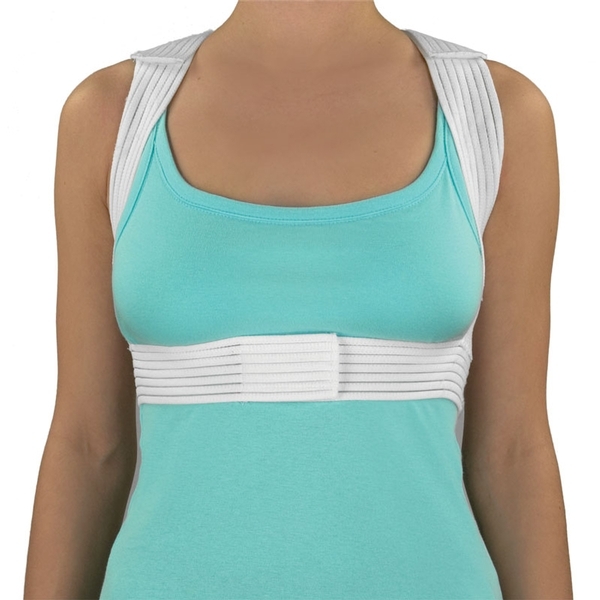 Designed to wear under clothes, this posture corrector has an adjustable strap design for a comfortable fit. It’s constructed of nylon and Lycra® with crisscrossed reinforced elastic bands and a front hook closure. The Posture Support Corrector is machine washable. Please note: If you are between sizes, the larger of the two sizes will typically fit more comfortably while still providing support. For women, the chest measurement should match bra size. I have had many patients use this. It is a great substitute for taping. It runs a bit small, so measuring is important. It is also important to slowly increase time of wear. I&apos;ve tried this on 2x and although I totally agree with the concept, I&apos;ve had much better success just using Tape. Needless to say, puting tape on by your self is not practical. As much as I wanted this product to work it is too tight and very uncomfortable. I know that I need to loose some weight. The first time I tried this product on I was many pounds lighter and it was still very uncomfortable and not wearable. I noticed there is a similar product that goes up to 45 (the one I have now is 2XL, but only goes up to 44). I&apos;m not sure this would be a big enough difference. Thank you for your review Peter. Please note that you ordered the size “L” Posture Support Corrector, which is designed for chest sizes 42-44 inches. We do, however, carry one size larger in this item: the “XL” is designed to fit chest sizes 46-48 inches.